With the decision to create US Marine Corps Forces, Special Operations Command (MARSOC) in 2006 as the Marine Corps element assigned to US Special Operations Command (SOCOM), the proof of concept marine special operations unit, US Marine Corps Special Operations Command Detachment, also known as Detachment One, was inactivated. After the establishment of US Special Operations Command (SOCOM) in 1987, the US Army, Air Force, and Navy all reassigned existing special operations units to the new command. Of the major services, only the Marine Corps did not contribute forces to the new command. The service's leadership saw the Corps as a general purpose force with inherent special operations capabilities that had to remain flexible in structure and maritime in nature. All of its components were seen as integral to its core mission of providing a ready maritime expeditionary force for any contingency. To associate any of its forces with a separate, independent command was seen as degrading this readiness. The Marine Corps ethos also branded the service as "special" in its own right, and there was an institutional resistance to conceding this to an outside Command. None of this was to say that the Marine Corps was not interested in being prepared and capable of conducting special operations. The specialized nature of the Marine Corps meant that many special operations type missions were firmly ingrained in the historical traditions of the Marine Corps. Since the Second World War, the Marine Corps had established a number of special operations type units, beginning with the Marine Raiders. Specialized reconnaissance elements became organic to Marine expeditionary units after the Second World War and continued to be integral well after SOCOM and even Marine Special Operations Command (MARSOC) were established. These included reconnaissance battalions, force reconnaissance companies, and Air Naval Gunfire Liaison Companies (ANGLICO). In 1985, the Marine Corps adopted a plan to enhance the special operations capabilities of what were then Marine Amphibious Units (MAU; later Marine Expeditionary Units; MEU). The specially trained MEUs were designated as "Special Operations Capable" or MEU (SOC). The decision by the Marine Corps to take a path separate from SOCOM created a significant tension between the 2 entities. Following the terrorist attacks on 11 September 2001, the Marine Corps made the decision to attempt to repair its relationship with SOCOM and perhaps even contribute its own element. It also became clear that without formal integration with SOCOM, the Marine Corps stood to be maligned in many ways in the conduct of a wide array of emerging missions. The response to the terrorist attacks highlighted the importance of both special operations forces and unified command structure for them. 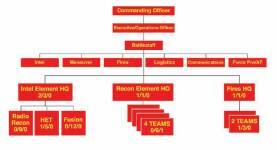 Initially, positions within the Marine Corps and SOCOM remained just as entrenched. Lieutenant Colonel J. Giles Kyser IV, who had in Summer 2001 assumed the duties of head of the Marine Air Ground Task Force (MAGTF) special operations section in Plans, Policies and Operations at Headquarters Marine Corps, became a diplomat of sorts between the Marine Corps and SOCOM. Lieutenant Colonel Kyser's objective became to establish a SOCOM/USMC board to explore the possibilities of further SOCOM/USMC interaction. On 9 November 2001, the Commandant of the Marine Corps General James L. Jones Jr. and the SOCOM Commander General Charles R. Holland had signed a memorandum of understanding, which paved the way for the board. The first meeting of the board occurred in January 2002 and discussed, among other things, the offer to provide a single platoon of Force Reconnaissance Marines made by the Commandant in the immediate aftermath of the events of 11 September 2001. The USMC eventually came up with a proposal for a larger unit. As there was no MARSOC at the time there was also some debate over how the unit should be aligned in SOCOM. Both Army Special Operations Command and Naval Special Warfare Command made arguments to have the USMC unit aligned with their elements if the decision was made to form such an element. Though the new element would eventually be aligned with Naval Special Warfare Command, it remained institutionally opposed to such a unit into Spring 2002. Naval Special Warfare Command was of the view that the Marine Corps was not itself sold on the contribution, had made no contributions when SOCOM was formed, and as a result, should not be allowed to make a contribution at that time. All these arguments and more, as well as finding funding for the new unit, were tackled by Lieutenant Colonel Kyser and those he had enlisted to help him. By the end of 2002, the new element was becoming a reality. Marine Corps Bulletin 5400, dated 4 December 2002, formally established the Marine Corps Special Operations Command Detachment as a 2-year proof-of concept test, in furtherance of the goals set forth by the USMC/SOCOM memorandum signed in November 2001. In January 2003, the unit began to form, being formally activated on 1 March 2003. The unit's command element was collocated with the I Marine Expeditionary Force's Special Operations Training Group (SOTG) for the first 3 months of its existence, and the SOTG provided key support to the formation of the new unit. 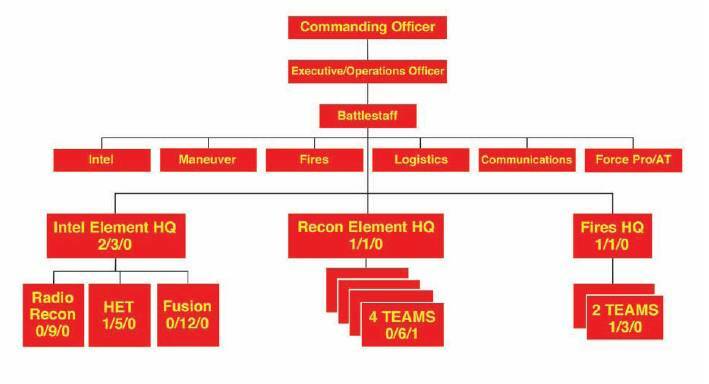 As it filled out its established table of organization, the new unit came to include a command element, a fires liaison element, and intelligence element, and a reconnaissance platoon with 4 reconnaissance teams, each with 6 Marines and a Navy corpsman. In many ways the new unit reflected existing Force Reconnaissance organizations, with additional intelligence and fire support elements, the latter also reflecting Marine ANGLICO units. The unit, also known as Detachment One, was equipped and armed much like other Marine Corps units, but included some specialized equipment, including the .408 caliber CheyTac Intervention sniper rifle. The unit immediately began training and by April 2004 the unit had integrated itself into Naval Special Warfare Unit One, to which it would be attached for its operational evaluation. The unit began deployment to Iraq on 6 April 2004 in support of Operation Iraqi Freedom, departing from Naval Air Station North Island, San Diego, California. In Iraq, Naval Special Warfare Unit One, with attached US Marine Corps Special Operations Detachment, became Naval Special Warfare Task Group - Arabian Peninsula, the lead element in charge of Combined Joint Special Operations Task Force Arabian Peninsula. US Marine Corps Special Operations Detachment was also known as Task Unit Raider, in reference to the Marine Raider units of World War II. US Marine Corps Special Operations Detachment soon became involved in intelligence gathering operations, including locating and capturing suspected insurgents. In addition, direct action missions, including protection details, were carried out by the unit in Fallujah, Al-Kut, and An-Najaf during its deployment. Between 27 September and 1 October 2004, US Marine Corps Special Operations Detachment departed Iraq and returned from its operational evaluation.